Traditional terms like “bride”, “groom”, “best man”, “maid of honour”, etc., are used here strictly as a matter of convenience. We realize these terms do not properly describe many of today’s wedding parties and we mean no disrespect by using them. Ladybug Florist is proud of the fact that we have been supplying flowers to culturally and sexually diverse couples since 1997. 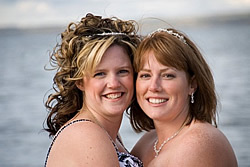 We look forward to working with you, regardless of the actual makeup of your wedding party. And please be assured, when better non-gender-specific terms (instead of spouse #1, spouse #2, person-of-honour) are available to describe the roles in a wedding, we’ll be the first to use them!